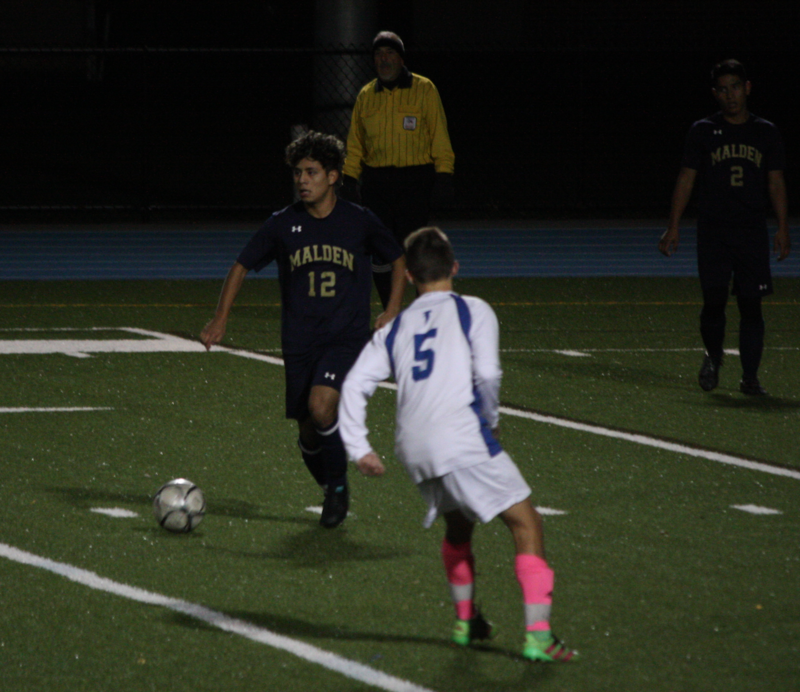 With expectations sky-high, Malden High’s boys soccer team faces a unique challenge ahead of them. A 2-0 loss at home against Framingham in the first round of the state tournament ended their 2017 campaign. This year, after graduating 18 seniors from last season, the new look Golden Tornadoes seek to shape their own identity while continuing the run of success within Malden’s boys soccer program in recent years. A 1-0 win against Everett on Tuesday, September 12th extended the team’s 100% start to the season and improved their record to 4-0. However, the team remains unsatisfied and motivated to improve. In his 14-year tenure as head coach of the varsity team, Jeremiah Smith has been in charge of many talented teams. This year is no different. “At this point in [his] career, the goal is the same every year,” said Smith. To reach their lofty ambitions, the team will have to improve rapidly and learn to play with each other. Only two regular starters from last season are returning this year- senior midfielders Douglas Oliveira Do Nascimento and Waldier Yacsavilca. Senior Douglas Oliveira Do Nascimento taking a free-kick. Photo from 2017-18 B&G Archives. In addition, veterans and newcomers alike will also have to step up and be productive, as well as lead on and off the pitch. Oliveira, who has been on the varsity team since his freshman year is taking an active leadership role and hopes to motivate his younger teammates. Another senior on the team is midfielder/defender Mattheus De Oliveira Farias, who is looking forward to a more active role on the team his senior year. 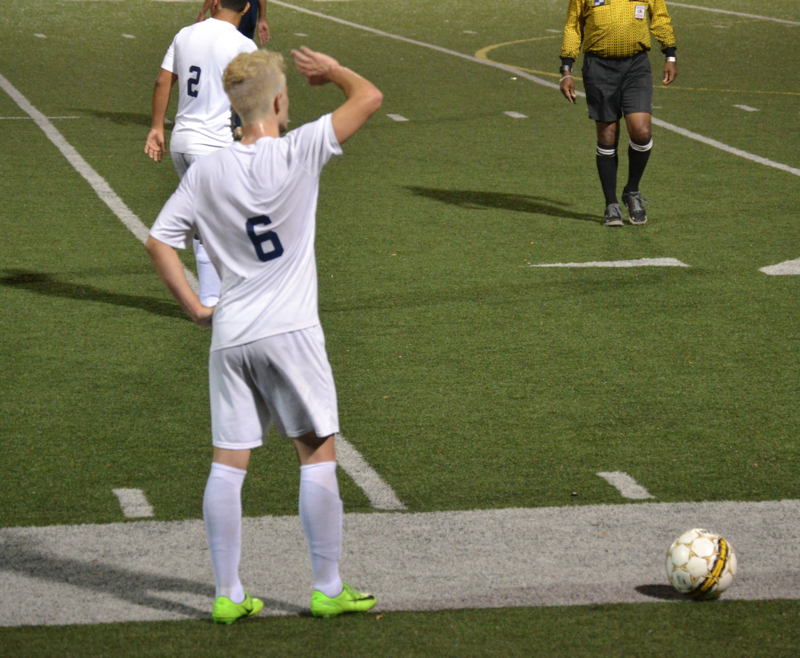 “You do not need the armband to step up and be a leader,” said Farias, who is in his third year as a varsity player. With the loss of 18 seniors from last season, the team has also lost a lot of their tall and physical players who were focal points in attack and were physical mismatches for opponents that could use their size to hold up play or battle for long balls. The team is smaller this year, but what they have lost in size, they have also gained in quickness and agility. The team has focused on capitalizing on their quickness and technical ability by emphasizing on playing short and quick passes to break down teams and create scoring opportunities. Playing an unorthodox 3-4-3 diamond formation with a sweeping center-back behind a holding defensive midfielder, the team has scored a combined 15 goals in their opening four matches. “[They] like to play short, [they] like to play fast, and [they] like to play on the ground,” explained head coach Smith. “It is just a different approach,” concluded Smith. Senior midfielder Waldir Yacsavilca looking to pass the ball to his teammate. Photo from 2017-18 B&G archives. Captaining the side this year is senior goalkeeper Salim Tiken, who has stepped into the position of starting goalkeeper as well captain with great pride. Despite being an undersized goalkeeper, Tiken uses his positional awareness and quick reflexes to get his palms on the ball routinely and play the position at a high level. As captain, Salim takes an added responsibility to be a vocal leader on the pitch and to be an example for his teammates. Improving the team defensively is one of Tiken’s biggest goal this season. In the first four games, the team has already conceded seven goals, something Tiken hopes to improve upon greatly. The boys did pick up their first clean sheet of the season against Everett on Tuesday, defending their slim 1-0 lead in the second half by absorbing heavy pressure from their opponents. However, Tiken still sees room for improvement defensively. “[They] gave up a lot of silly fouls,” pointed out Tiken. The boys look to continue to improve collectively and eventually make a deep run in the state tournament. They host Lynn English on Monday, September 24th and look to continue their winning start to the season.